A fun blaster with good performance, but with some grip issues. 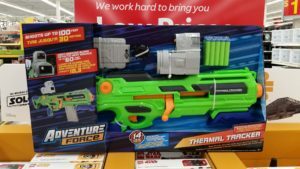 Walmart makes deals with various toy manufacturers to market their products for cheap under their in-house “Adventure Force” brand, and dart blasters are no exception. 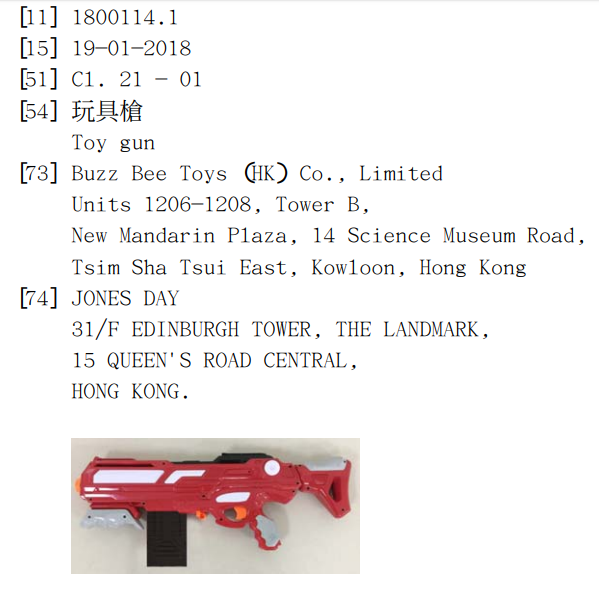 Zuru, Prime Time Toys, and Buzz Bee Toys have all made blasters and darts available under the Adventure Force name. This year, that line is expanding aggressively, pushing many models to take up nearly as much space on the shelves as Hasbro does with Nerf. In the case of the Thermal Tracker, it’s using a Buzz Bee design to deliver bolt-action, clip fed blasting with heat-sensing optics. It’s not the platform for everyone, but it does its job well! Note that this model was spotted in Walmart Canada. Price stats will be updated once spotted in the United States. The Hong Kong Design Patent for the Thermal Tracker, in red. One look at the shell and you can see several design cues from previous blasters. 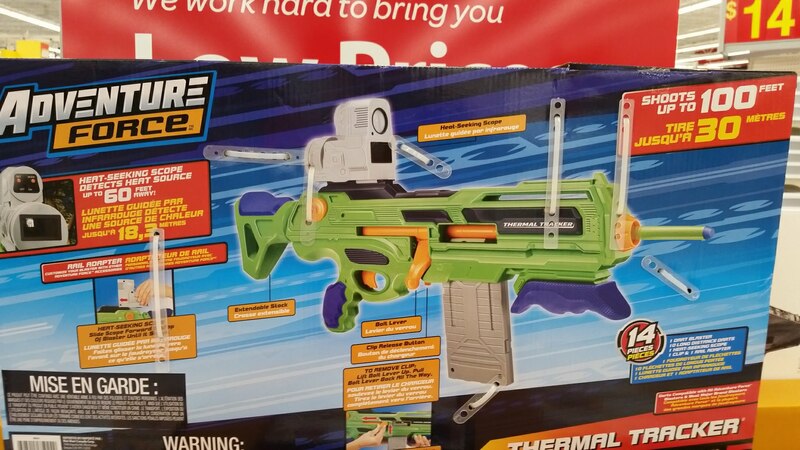 The Thermal scope, which changes color when detecting a heat source stranger than the background, comes from the Thermal line of blasters last year (at Target). The small main grip and stock, unfortunately, are also inherited. However, due to blaster shape, the top of the dominant hand is no longer cramped – there’s actually room for the thumb. In addition, the small stock extends two inches from the base position, thanks to a button on the side of the stock. 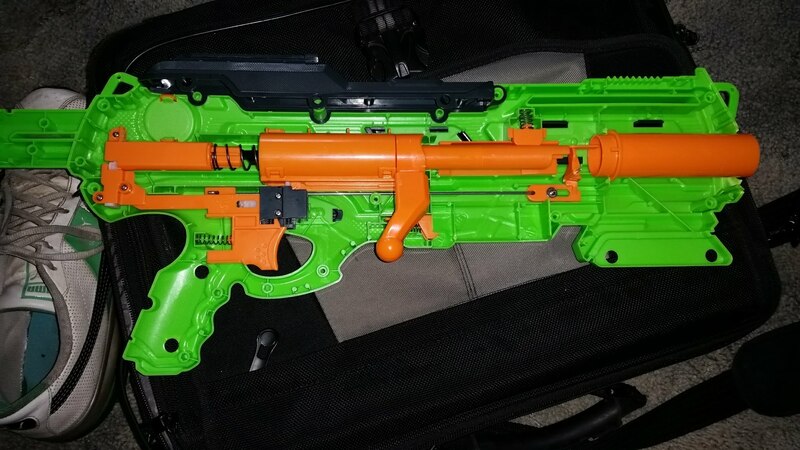 The grip and stock were the worst parts of the Thermal Hunter; this is a good improvement, even if it still errors in favor of the grip of small children. The propulsion system, meanwhile, is the same as that used in the Buzz Bee Snipe (100ft range version). A bolt rotates around the dart barrel, and pulls back the entire plunger tube assembly. The system has a slow rate of fire – only one dart per second – but it works reliably. One ten dart magazine is included, as are ten Long Distance darts (in green and blue). The shell is on par with other Buzz Bee blasters – not quite as solid feeling as Nerf blasters, but still quite sturdy. The Thermal Tracker has the expanded plunger tube like most recent Buzz Bee offerings. That, combined with the familiar catch and spring setup, means that spring replacements should work as well as they did in the older models. Note that the front orange ring is solvent welded on. Additionally, the internals sit on the “Screw” side of the shell. If you remove the screws and lift the halves apart without turning over, expect some pieces to fall out. As it currently stands, the stock internals average 70fps with Elite darts, and 72fps with the included (and slightly lighter) Long Distance darts in my testing. Additionally, the Long Distance darts have no accuracy whatsoever, with even close shots missing by a large margin. 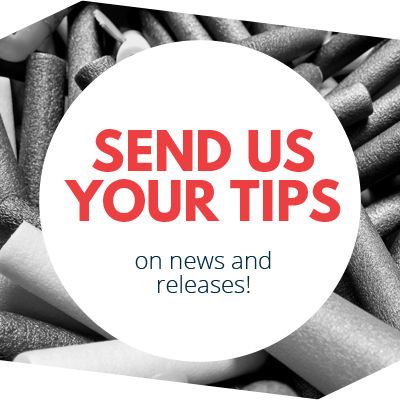 Use better darts! Two rails exist for scope attachments, one at the very front and one above the trigger, which is a removable shell piece. I got to use this blaster for a few rounds at the HvZ Kentuckiana event yesterday, where it performed well. The blaster didn’t have any malfunctions, and shot straight when using the waffle darts and Accufakes I had on hand. The slow rate of fire meant having to do more running, however, and I died after botching a change in clips. That, however, was due to being unfamiliar with the blaster, not the system itself. Later reloading worked perfectly, when I wasn’t trying to jam the clip into the back of the forward grip! 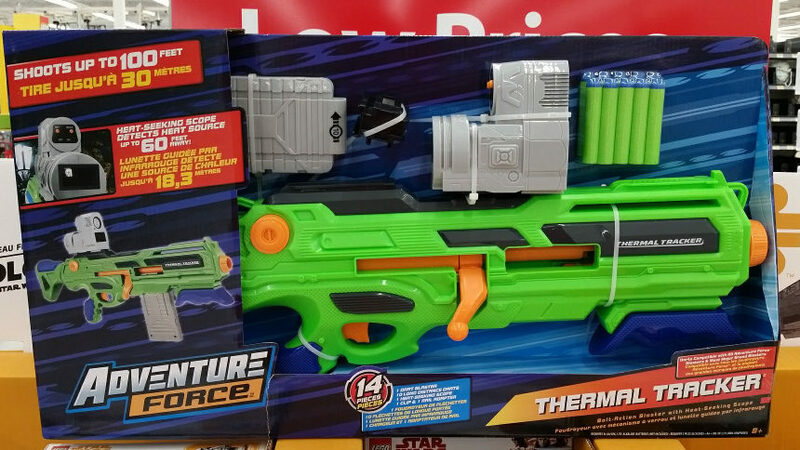 The Adventure Force Thermal Tracker (and the Buzz Bee branded variant that may show up elsewhere) is a decently performing, bolt-action blaster. It’s not designed for a high rate of fire, but for the feel of priming and firing. If you like bolt-action, however, you won’t be disappointed. I would expect the same amount of modding potential as previous iterations, and the shell is, on balance, an improvement over aspects of earlier blasters. I still doubt you’ll like the grip, however, unless you have small hands. 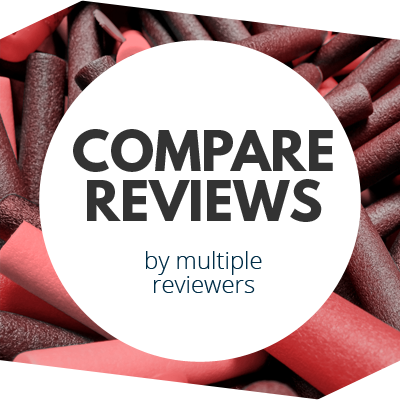 This entry was posted in Dart Blasters, Reviews and tagged 2018, adventure force, blaster, blaster hub, buzz bee, review, thermal tracker on July 29, 2018 by BuffdaddyNerf. Awesome review, can’t believe I missed the Kentuckiana HvZ, oh well. Will be looking for it at the Fern Creek Wal-Mart.